This contract template is a comprehensive Exclusive Distributor Agreement for use between a manufacturer and a corporation or individual who is appointed as exclusive distributor for the sale of Manufacturer’s products in a defined territory. The agreement is designed for use in particular when U.S. law applies but its terms can be applicable elsewhere. You need this document if you are a manufacturer looking for a comprehensive contract to appoint a distributor in a defined territory. 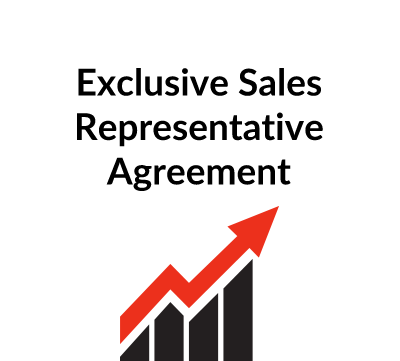 This Exclusive Distributor Agreement is designed for use between a product manufacturer (“Manufacturer”) and an independent distributor (“Distributor”). It can be signed either by an individual distributor or by a corporation or other entity. If one of the objectives of Manufacturer is to avoid an employer-employee relationship with a distributor who is an individual, it can be beneficial from a planning perspective for the distributor to set up an intermediary corporation or limited liability company which then enters into this Agreement as Distributor. 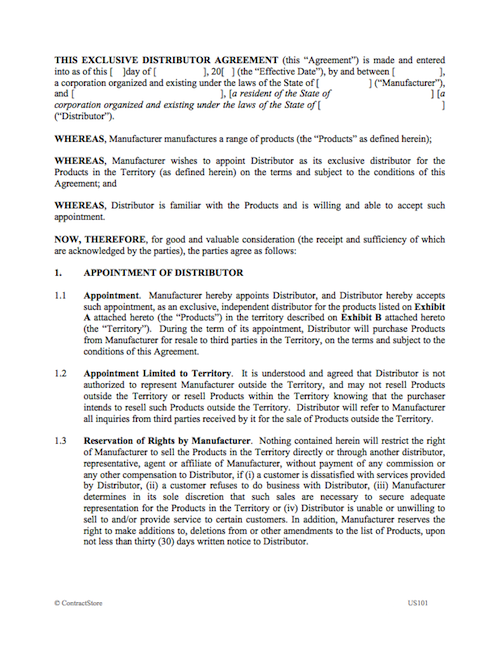 Under this form, Manufacturer retains Distributor on an exclusive basis to promote and sell certain named products (listed on Exhibit A) in a defined territory (delineated on Exhibit B). The distributor is authorized to sell products provided by the manufacturer in a designated territory and derives its compensation from the markup it receives from resale. The distributor buys the products from the manufacturer for its own account and resells them to its own customers for its own account. The distributor has no authority to bind the manufacturer. The distributor bears all commercial risks associated with the resale. The distributor maintains an inventory and is responsible for distribution of products to its customers. The distributor typically sells the products in their original packaging and labels. A distributor may be retained either on an exclusive or on a non-exclusive basis. In the specific context of distributor or dealer agreements, the state of Wisconsin and the territory of Puerto Rico stand out as having statutes that are strongly protective of local distributors, and a number of other states have protective statutes that apply to distributors and dealers of particular product lines (e.g., beer, automobiles and farm equipment, to name a few). These statutes may restrict the ability of Manufacturer to make changes to the Product line or Territory, or otherwise to terminate (or decline to renew) the Agreement. When in doubt, it is imperative to consult with competent legal counsel admitted in the state in question, as liabilities for Manufacturer under such statutes can be considerable (though this ends up being mostly a due diligence exercise as such liabilities cannot usually be excluded by contract). This form can be used in the international context, and provisions that are intended to accommodate such use are identified below. A number of foreign countries also have legislation protective of local distributors or dealers (Costa Rica, Belgium and most countries in the Middle East, to name a few). These statutes may restrict the ability of Manufacturer to make changes to the Product line or Territory, or otherwise to terminate (or decline to renew) the Agreement. As a result, it is imperative to consult with competent legal counsel admitted in the country in question as liabilities for Manufacturer under such statutes can be considerable (though this ends up being mostly a due diligence exercise as such liabilities cannot usually be excluded by contract). This form provides a good starting point for preparing a first draft of an Exclusive Distributor Agreement. However, as with use of any form, it is very important to take the time to read the form in its entirety to ensure that it is customised appropriately for use in your individual situation. For all but the simplest of transactions, it can be anticipated that some customisation will be in order; and as mentioned above, it may also be advisable to consult with competent legal counsel. Alternate signature blocks are included to accommodate execution by corporate parties and individual parties. These should be duplicated and/or deleted and customised as required. The italicised language in brackets is for guidance only and should be deleted. D – Warranty – only if the third option in paragraph 4.1 is used (see below). Paragraph 1.1 contains the basic terms of the exclusive appointment. The Products and the Territory should be defined on Exhibits A and B respectively. Note that although the basic appointment is on an exclusive basis, paragraphs 1.2 and 1.3 contain some customary limits on the distribution rights of Distributor, and these should be reviewed for consistency with the terms agreed upon by the parties. The protective statutes described above may preclude changes to the Product list as anticipated in paragraph 1.3. Paragraph 2.1 defines the obligations of Distributor in fairly standard terms. Among other provisions, paragraph 2.1.12 anticipates that Distributor will agree to a minimum purchase volume which will be set forth on Exhibit C. Under paragraph 2.1.12, failure to meet the minimum requirement means that Manufacturer can opt to terminate Distributor’s exclusive rights or even terminate the Agreement; and in this regard, the brackets and bracketed language that is redundant should be deleted. Paragraph 2.2 requires Manufacturer to provide certain support to Distributor in the form of sales and product literature. This provision also deals with translations of such literature (which, though more common in the international context, may also be important within the United States in regions with large non-English-speaking ethnic populations). Paragraphs 3.1 through 3.6 deal with the basic terms and conditions of sale as between Manufacturer and Distributor. Paragraph 3.1 requires Distributor to provide 30 days notice of requested shipment of a Product order, and gives Manufacturer 10 days to accept the order (in whole or in part) – these time periods are in brackets and should be adjusted as required by the parties’ business practices. Paragraph 3.2 governs shipment – here the parties should (if necessary) replace the F.O.B. shipment term and insert the place of shipment. Paragraph 3.3 governs pricing and anticipates that Manufacturer may from time to time authorize discounts from list prices. The brackets and bracketed language that is redundant should be deleted. Paragraph 3.4 governs general terms of payment, which should be completed as required by the parties’ business practices. Paragraph 3.5 contains alternate language for security for payment – the first option provides that Distributor must provide the security if it fails to make payment as required, and the second option provides that Distributor must provide the security within a stipulated number of days from the Effective Date (to be completed by the parties). Paragraph 3.6 provides a standard form of retention of title clause. In the United States, retention of title clauses in contracts for the sale of goods generally take effect as liens on the goods that are being sold. The other point to note about such clauses is that if they are effective under the laws of another country, they may result in Manufacturer having a taxable presence in that other country to the extent that Manufacturer is warehousing Products there. As a result, caution is advised when using such clauses, particularly in the international context. Paragraph 4.1 contains three different options for describing the standard warranty provided by Manufacturer with respect to the Products. Note that the third option anticipates that the parties will attach a form of warranty as Exhibit D to the Agreement. Paragraph 4.2 allows the Manufacturer to make changes to the warranty on a going-forward basis, on 30 days written notice to Distributor. Paragraph 4.3 describes a number of exclusions from the warranty. Paragraph 4.4 describes the remedies for breach of the warranty – repair, replacement or refund of the purchase price (at the option of Manufacturer). Paragraph 4.5 contains standard language excluding other (implied) warranties and special, indirect, incidental and consequential damages. The law in most states requires such exclusions to be “conspicuous”; in this form, they have been printed in all capital letters. The bracketed language in the middle of the paragraph should be left in only if merchantability and fitness for purpose are not included in the limited warranty; if it is redundant it should be deleted. Paragraph 4.6 provides that the limited warranty and the limitations thereon will survive termination of the Agreement. Paragraph 5 confers upon Distributor relatively broad rights to use certain trademarks and other related intellectual property of Manufacturer in connection with performance of Distributor’s obligations under the Agreement. Paragraph 6 contains alternate language with respect to the appointment by Distributor of sub distributors and other third parties to sell Products. The first option allows Distributor to appoint such third parties, subject to certain specific limitations. The second option requires the prior consent of Manufacturer, and then (in the bracketed language) either limits or does not limit the discretion of Manufacturer in this regard. The brackets and bracketed language that is redundant should be deleted. Paragraph 7 requires Distributor to keep records of its transactions and to make certain periodic reports to Manufacturer. Additional liabilities may attach to the parties’ relationship if it is deemed to be an agency, partnership, joint venture, employment or other similar relationship. Paragraphs 10.1 and 10.2 are intended to make clear that the parties are independent contractors and have no authority vis-à-vis one another other than is expressly provided in the Agreement. Paragraphs 10.3 and 10.4 are intended to clarify that Distributor is liable for obligations relating to its employees. Paragraph 10.5 is relevant only if this Agreement applies in an international context, by requiring Distributor from refraining from conducting its activities in a way that would result in Manufacturer having a taxable presence in Distributor’s country; if not relevant it should be deleted. Indemnification provisions are customary in contracts particularly where significant liabilities are possible. This is a standard form provision that purports to make Distributor responsible for any damages caused to Manufacturer as a result of negligence or other misconduct, breach of contract, or claims from certain third parties. Note that this provision is expressed to survive termination of the Agreement, and does not expire by its own terms. This Agreement is set up to be in force for a fixed term to be specified in paragraph 14.1. Upon the expiration of this term, the Agreement terminates. Other options are possible here (e.g., automatic renewals unless either party serves notice of non-renewal, rolling renewal terms, etc.). In the product distribution context, the automatic termination is preferable as goes the furthest in preserving basic “at-will” termination rights upon expiration of the term, though it does force the parties affirmatively to renew or renegotiate its terms at that time. Note that any provision that allows manufacturer to terminate or decline to renew a distributor or dealer agreement may be void under local protective statutes in a handful of U.S. states and a number of foreign countries. Paragraph 14.2 describes some limited circumstances in which one party or the other can terminate the Agreement prior to its term. Note that paragraph 14.2.1 allows termination on an at-will basis upon six months notice, which should be reviewed carefully in case it would not be in the interests of one party or the other to allow such an abrupt termination. (This type of provision may also be void under local protective statutes in a handful of U.S. states and a number of foreign countries.) Paragraph 14.2.2.2 also allows termination for material breach by the other party – which expressly includes any promotion or sale by Distributor of any Products outside the Territory or any failure by Distributor to satisfy its minimum purchase requirements under the Agreement. Paragraph 14.3 contains a description of the major consequences of termination of the Agreement (including an option on the part of Manufacturer to repurchase Distributor’s inventory of the Products). Paragraph 14.4 provides that certain terms may survive termination of the Agreement. Paragraph 14.5 contains a provision to the effect that Distributor waives any right to payment under applicable distributor or dealer protection statutes. Although it is customary to put a term to this effect in distributor contracts, it is unlikely to be given effect in jurisdictions with strong distributor or dealer protection statutes. Choice of law can be contentious in U.S. contract negotiations because there are 50 states to choose from, and each party may have an instinctive bias in favour of using its own state law. Unless there is some reason to pick another state’s law (e.g., more favourable substantive law), it is customary to pick the laws of the state with which the drafting party is most familiar (again, usually its own state). This choice of law provision picks the laws of a single state (federal laws apply regardless of the state law election), which is most likely to be respected by the courts if it has some relationship to the contract (subject to application of mandatory principles of local public policy). However, it is important to note that this choice of law clause may be void under local law to the extent that it attempts to exclude local distributor and dealer protection statutes in some U.S. states and a number of foreign countries. In U.S. contracts for the international sale of goods, the specific exclusion of the U.N. Convention on Contracts for the International Sale of Goods (the CISG) is common and reflects a typical bias in favour of applying U.S. sales laws over the laws imposed by an international treaty (the interpretation of which is often unclear). Note that unless it is specifically excluded, the CISG will apply to any sales contract where both parties are from countries that are signatories to the CISG. If this Agreement is being used in a purely domestic setting, then the bracketed language relating to the CISG can be deleted. In U.S. litigation, the prevailing rule is that each party bears its own litigation costs (subject to some narrow statutory and other exceptions). The language in paragraph 14.3 is intended to impose the so-called “English rule” to litigation costs. • The force majeure periods in paragraph 16.1 should be adjusted in light of the nature of the Agreement and the term of the Agreement as a whole. • Notice information should be completed in paragraph 16.2. Notice by e-mail could also be added as an option if the parties are comfortable with this method of notice. • The non-assignment provision in paragraph 16.5 contains a couple of options between which the parties should choose. The brackets and bracketed language that is redundant should be deleted. • Paragraph 16.7 should not be deleted. Most states have moved away from an “all-or-nothing” approach to enforcing illegal or unenforceable contract provisions, and the severability provision in paragraph 16.7 is an attempt to instruct a court to take a flexible approach to the Agreement in the event that one or more clauses prove to be illegal or otherwise enforceable, provided that it is still possible for the essential intent of the parties to be achieved.